The National Rifle Association is holding its annual meeting in Indianapolis, IN, this week on the heels of recent reporting about the group’s lawsuit against its own ad agency, ongoing budget problems, and a divided board of directors. The event kicked off with an evening banquet on April 25 at the Indiana Convention Center and will continue with three days of speakers, seminars, and workshops as well as an exhibition showcasing, guns, ammunition, and firearm accessories. The NRA’s Institute for Legislative Action, the organization’s lobbying wing, is hosting the flagship event, the NRA-ILA Leadership Forum, beginning at 11 a.m. on Friday, April 26 at the Lucas Oil Stadium. Speakers for the “stacked” event include President Donald Trump, giving the keynote address, Vice President Mike Pence, Sen. Ted Cruz (R-TX), and Rep. Steve Scalise (R-LA). Several NRA officials, including Executive Vice President Wayne LaPierre, NRA President Oliver North and ILA Executive Director Chris Cox will also be speaking. This year’s annual meeting comes amid multiple reports of a troubling financial situation at the NRA and a fractured board of directors. On April 12, the NRA filed a lawsuit against its ad agency of nearly 40 years, Ackerman McQueen, which also produces the group’s media outlet, NRATV. According to The Wall Street Journal, the lawsuit alleges that the company “was obliged to provide access to records underlying its bills” to the NRA, but “rebuffed or baldly ignored” the group’s requests. The lawsuit also highlights a split between what the Journal described as the “pro-Ackerman McQueen faction” of the NRA’s board, which reportedly includes North and which argues that the law firm leading the lawsuit is charging too much, and those who claim it is money “well spent, because it’s for the survival of the NRA,” which reportedly includes LaPierre. The Trace, in partnership with The New Yorker, unearthed more than a decade of financial problems at the NRA, as described in a lengthy April 17 article, reporting that “in recent years, it has run annual deficits of as much as forty million dollars” to focus on “messaging” while spending less than 10% of its budget on firearms education, safety, and training. Tax documents mentioned in the article reportedly show “a small group of N.R.A. executives, contractors, and venders” received “hundreds of millions of dollars from the nonprofit’s budget, through gratuitous payments, sweetheart deals, and opaque financial arrangements.” One senior NRA employee went as far as to “describe a workplace distinguished by secrecy, self-dealing, and greed.” Meanwhile, the NRA, “in desperate need of funds, raised its dues for the second time in two years” and cut costs by eliminating “free coffee and water coolers at its headquarters” and freezing employees’ pension plans. Trump will give a speech at the meeting for the fifth year in a row. The meeting will have a Women’s Leadership Forum on April 26, featuring Fox & Friends favorite Dean Cain as the keynote speaker. Previous speakers have included Fox’s Sean Hannity and Tucker Carlson. The NRA announced that pro-Trump conservative media pundit Candace Owens will speak at the NRA-ILA Leadership Forum. Owens recently came under fire for saying Adolf Hitler would have been “fine” had he focused only on Germany. Discredited pro-gun researcher John Lott will give talks throughout the three-day event, with one offering “an in depth understanding about the debate over concealed handguns” and another supposedly debunking “gun control lies,” including “the facts relating suicides to gun ownership.” His organization, Crime Prevention Research Center, will also have a booth in the exhibition hall. NRA board member and Fox News contributor Allen West will host the event’s prayer breakfast on April 28. West has a long history of making controversial remarks, such as saying “the Black community was stronger” and “had better education opportunities” during segregation. The NRA said “firearms and firearm accessories … will be prohibited” in the stadium during the ILA’s Leadership Forum at the request of the Secret Service due to the president’s and vice president’s appearances. The NRA has long claimed that “gun-free zones” are more attractive for mass shooters than places without such a designation and that they make those in them unsafe. Featured products on the exhibition floor include a firearm disguised as a cellphone for “max concealment,” “hip hugger” holsters for concealed carry, and a corset that doubles as a holster. The Trump Make America Great Again Committee, a joint fundraising committee of Donald J. Trump For President Inc. and the Republican National Committee, and Women for Trump, a project of the Women Vote Smart PAC, will both have booths on the exhibit floor. Conservative think tank the Heritage Foundation, pro-Trump Liberty University, and conservative Hillsdale College will all have booths at the NRA’s exhibition. The Wall Street Journal published an editorial on April 23 that derided electric vehicles in Germany as "dirty," based on a recent study that has been called into question by a number of experts and mainstream German news outlets. 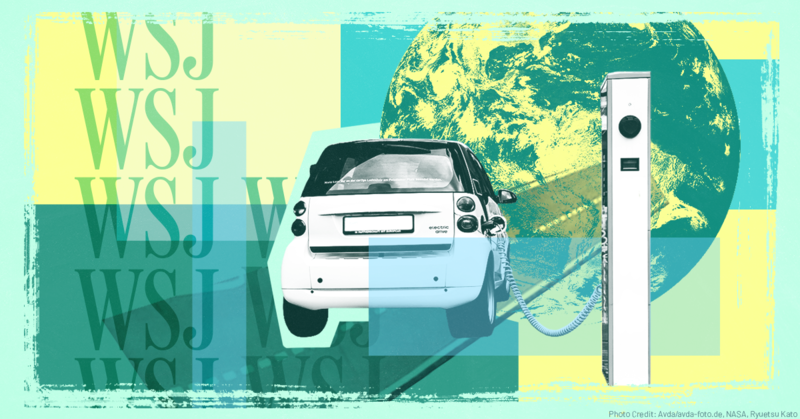 The Journal's editorial board, which has a history of climate denial, has attacked both German energy policy and electric vehicles (EVs) before. The dubious study has also been hyped by climate deniers and right-wing outlets in the U.S., including Infowars and The Daily Caller. The study was conducted by the Ifo Institute, a Munich-based think tank, and argued that a Tesla Model 3 electric vehicle driven in Germany is responsible for more carbon dioxide pollution than a Mercedes C220d diesel vehicle. The study, which was released in German on April 17 and has not yet been translated into English, finds that the Tesla emits between 156 and 181 grams of CO2 per kilometer driven, compared to 141 grams of CO2 from the diesel Mercedes. The study attributes roughly half of the Tesla's emissions to the vehicle’s production process, including its battery, which the authors assume will only last 10 years or 150,000 kilometers. The other half of the Tesla’s estimated emissions in Germany come from electricity used to charge the car, some of which is generated by burning coal. English-language summaries of the study include a press release from the Ifo Institute and a Brussels Times write-up. Soon after the study's release, German-language outlets started pushing back on its findings and methodology, including Der Spiegel, the highest-circulation news magazine in Europe, and WirtschaftsWoche, a weekly business news magazine. Articles in both publications highlighted miscalculations and faulty assumptions, and pointed to a number of other studies on EVs that had come to opposite conclusions. To summarize: EVs only emit more CO2 if you make unrealistically negative assumptions for battery production, battery life and electricity mix while making unrealistically positive assumption about diesel consumption. Correct ANY of these and the tables are turned. Bigly. Hoekstra also argued that the analysis should not be presented as an academic study. Instead, he characterized it as “the opinion of three people, … none of whom have any background” in EVs or batteries. One of the authors, Hans-Werner Sinn, has been criticized for using dubious assumptions in energy studies before: Sinn received strong pushback on a 2018 paper he wrote claiming that energy storage requirements ultimately limit the expansion of renewable energy. Sinn has also argued that criticism of Volkswagen over its role in the Dieselgate scandal has been exaggerated, and placed much of the blame for the scandal on U.S. efforts to regulate diesel engines. One of the biggest mistakes they are making is that they are comparing the full production and lifecycle of an electric vehicle, including the emission from the electricity uses, against the production and lifecycle of a diesel car without accounting for all the energy used to produce the diesel and supply it to the cars. Lambert also called out the study’s authors for falsely assuming a battery life of 150,000 kilometers and for failing to note that Germany is planning to rapidly decarbonize its electricity system, which would greatly improve the carbon footprint of EVs in the near future. Another criticism of the study has been its focus solely on Germany's energy grid and the authors' failure to take into account the overall mix of the larger European energy market that Germany is a part of. German carmaker Volkswagen, which manufactures both EVs and diesel vehicles, responded to the study by defending EVs. In an English-language article by Deutsche Welle, a German international broadcaster, Volkswagen noted that with Germany's current electricity mix, its Golf EV would have a similar CO2 output as a diesel car of the same type -- 142 grams per kilogram compared to 140. However, “using the European energy mix for calculations, which includes large amounts of nuclear energy from France and water power from Norway, the e-Golf's carbon footprint would be down to 119 g/km” -- far below the CO2 output of a diesel car. Other analyses have disproved the claim that EVs are not environmentally friendly. In 2018, the Union of Concerned Scientists found that a U.S.-based EV is equivalent to a conventional gasoline car that gets 80 miles per gallon. Unlike the German study, it looked at all of the emissions from fueling and driving both vehicles. It also found that EVs will get cleaner over time as electric grids get cleaner, noting that its 2018 estimate was an improvement of 7 mpg from 2017. And a 2017 report from the Transport & Environment group, a Brussels-based transportation policy group, found that EVs emit fewer greenhouse gases than diesel cars even when EVs are powered by the most carbon-intensive electricity. 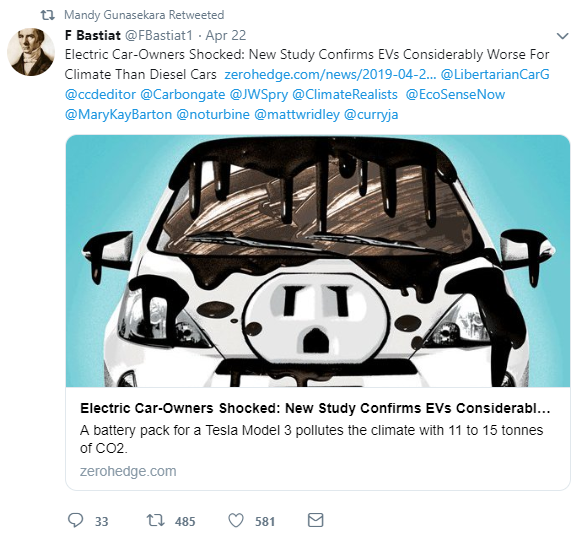 Although the Ifo study is specific to Germany’s electric grid and has been widely criticized, climate deniers and right-wing outlets in the U.S. have picked up on it and are using it to disparage EVs generally. Steve Milloy, a notorious denier and frequent Wall Street Journal contributor, tweeted about the study on April 19. On April 22, extreme right-wing outlet Infowars wrote about the study, and far-right conspiracy theorist Paul Joseph Watson tweeted about the Infowars piece. The right-wing website Zero Hedge wrote about the study too, and a tweet pointing to that post was retweeted by Mandy Gunasekara, a former Trump EPA official and current Fox News contributor. After The Wall Street Journal wrote about the study, still more right-wing outlets covered it, including The Daily Caller, which has a long record of inaccurate reporting on climate and energy issues, and The Western Journal, a conservative news outlet with a history of deceptive climate claims. The Wall Street Journal's opinion pages have spread misinformation about climate change for decades. A Media Matters study found that from January 2015 to August 2016, one-third of the paper’s climate-related opinion pieces contained climate denial or other inaccurate statements about climate change. We’ve also found that the paper's opinion section is ExxonMobil’s chief apologist for its climate change lies, and it has defended the fracking industry against accusations that it contaminates drinking water. According to a recent article in Current Affairs, the Journal has shifted in recent years from denying climate change to downplaying it, but still remains an impediment to clean energy and climate action. The Wall Street Journal has always been a pro-polluter, pro-industry paper, so it’s no surprise that it would overlook flaws and publicize questionable research that disparages a direct threat to the fossil-fuel industry. 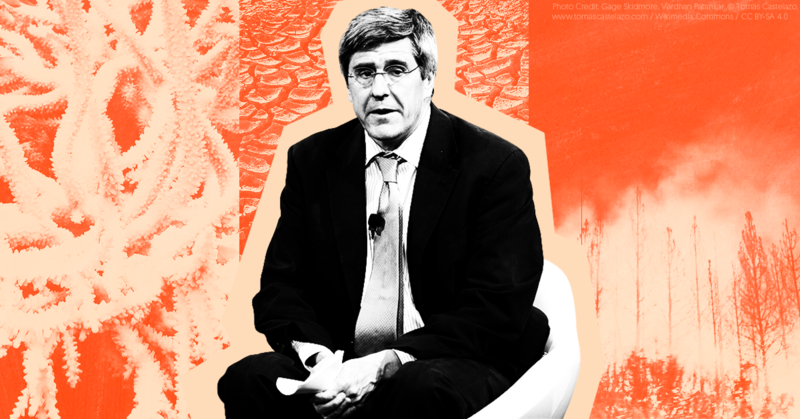 Stephen Moore, President Donald Trump’s pick for a seat on the Federal Reserve Board, hates support for climate change science so much that he previously attacked Ivanka Trump as an elitist who’s friends with “Manhattan liberals” for her supposed (but ineffectual) support for action on climate change. Fracking is "like the equivalent in health care of a cure for cancer." In a June 1, 2017, radio segment shortly before the announcement, radio host Rose Tennent brought up Ivanka Trump’s reported attempt to influence the president’s Paris accord decision and told Moore that while she loves the Trumps, she “didn’t vote for” her and her husband Jared Kushner. Moore responded by stating that he has “nothing but respect for them” and believes they’re “brilliant,” “hard-working,” and “impressive,” but then trashed Ivanka as out-of-touch. ROSE TENNENT (HOST): One of the things though I was reading yesterday, when some of the people around him -- for example, his daughter who is very influential, she doesn’t want him to leave. 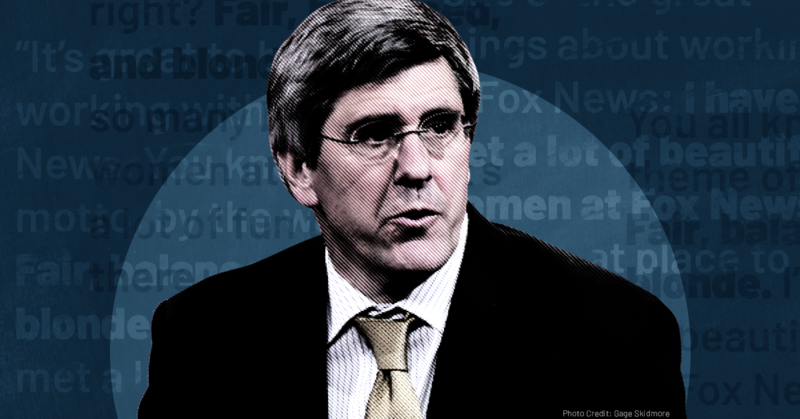 STEPHEN MOORE: No, she doesn’t. TENNENT: And, yeah, and see, this is this one of my concerns. Steve, I’m going to be honest with you, and I love the Trumps. I mean I’ve interviewed every one of them. My favorite is Eric, I think he’s just amazing. You know I love them. But I don’t necessarily -- I didn’t necessarily vote to have Ivanka and her husband in the White House and having that great of an influence over Donald Trump. I love that they can -- that he has somebody to lean on and trust and count on. But I just didn’t want that input because I didn’t vote for them. I would never vote for Kushner. You know what I mean? MOORE: Well, I got to know Jared and Ivanka as well on the campaign trail. And, by the way, I have nothing but respect for them. MOORE: -- and so impressive in every way. But look. Where did they grow up? They grew up in Manhattan. You know? I mean, they have a different view of the world. Right? I mean, think about who all of Ivanka’s friends are: They’re Manhattan liberals. And, you know, so, I think her attitude about this has been colored by the fact that she’s hanging out with people. They don’t -- the people that, you know, grew up in Manhattan, they don’t know steel workers, they don’t know coal miners, they don’t know people who are welders and pipefitters. And those -- again, I go back to the point that it’s working-class Americans who are going to pay the price for this if we go forward. While Moore suggested he’s a champion of “working-class” non-Manhattanites, in 2014, he called Cincinnati and Cleveland some of the "armpits of America." 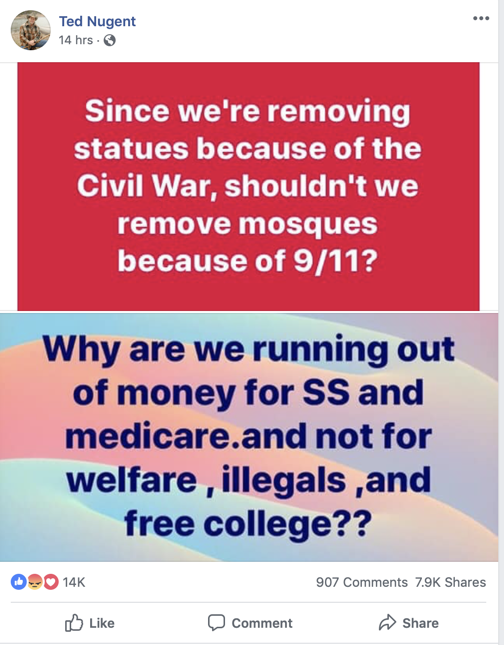 National Rifle Association board member Ted Nugent suggested in an April 24 Facebook post that if we’re going to remove Confederate statues “because of the Civil War,” we should “remove mosques because of 9/11.” Nugent’s comment is a reference to recent efforts and movements in several states to remove Confederate statues from public spaces. Nugent posted the comparison just two days before the NRA annual meeting in Indianapolis, IN, which he announced on April 22 that he’d be attending to “stand up loud and proud for the sacred second amendment and the mighty NRA.” Nugent has made inflammatory comments during previous annual meetings: In 2015 he used an analogy that involved him shooting former Democratic Senate Minority Leader Harry Reid and in 2012 he called for members to “ride into that battlefield and chop [Democrats’] heads off in November.” The 2018 annual meeting featured a gun line sponsored by Nugent, who branded the product his “American spearchucker series,” a reference to a racial slur used to disparage Africans. Earlier this month, Nugent was reelected to the NRA board of directors through 2022, receiving the second most votes behind NRA President Oliver North. 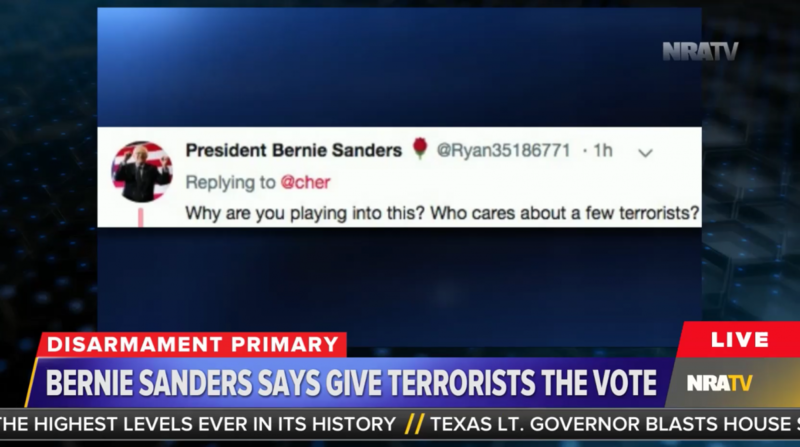 GRANT STINCHFIELD (HOST): The fact is it may be one of Bernie Sanders’ responses to Cher that is the most offensive. “Who cares about a few terrorists,” he writes. Who cares about a few terrorists? I would argue the family members of hundreds of victims of the Boston bombings, that’s who, all of us who lived through 9/11, who knew people who died there and felt it first hand, what jihad means and what it is: Death to America. We care, Bernie Sanders and your supporters. We care about terrorists not voting from behind bars. The 5 1/2 million members of the NRA care because we love this country. Stinchfield often broadcasts patently false information on his NRATV show. On Election Day 2016, Stinchfield read from and discussed an article in an NRA magazine about the supposed horrors a Hillary Clinton presidency would bring while urging people not to vote for her. The article -- which raised the prospect of Syrian refugees establishing an “Islamic State in the United States” culminating in a nuclear attack on U.S. soil -- was labeled “fiction” by the NRA magazine. Moore also said during an October 2017 appearance on CNN that he got “very good advice” from a CEO who told him to “never have a meeting with a woman without someone else in the room” because women have reported sexual harassment against people in a “position of power” like Bill O’Reilly and Trump. Moore worked as a Fox News contributor from 2013 to early 2017, when he left the right-wing network for CNN (after Trump's Fed announcement, CNN removed him as a commentator). He also frequently appeared on Fox News as a guest before becoming an official commentator. Fox News’ workplace culture has been toxic for years, especially for women. During a November 15, 2012, speech for the Citizens' Council for Health Freedom, Moore said: “People are always asking me, ‘What’s Greta [Van Susteren] really like?’ And I say, ‘Greta is absolutely perfect for Fox News. She’s fair, balanced, and blonde.’ And that is the philosophy of Fox News. ... One of the great things about working at Fox News: I have met a lot of beautiful women at Fox News. It’s a great place to work.” The Washington Post first reported on that remark. On April 24, President Donald Trump tweeted that former CIA analyst Larry Johnson has accused the United Kingdom's intelligence agencies of “helping Obama Administration Spy on the 2016 Trump Presidential Campaign.” Trump was apparently tweeting in response to a segment he watched on One America News Network, a conservative cable news channel. 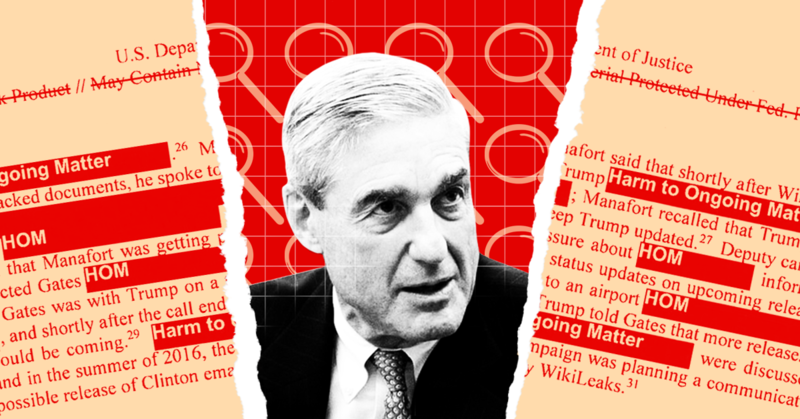 In doing so, the president has resurfaced a conspiracy theory from a discredited fraud that -- when Fox News promoted it in 2017 -- helped cause an international incident between the United States and the United Kingdom. Larry Johnson is a conservative conspiracy theorist notorious for pushing the racist smear that there was a tape of former first lady Michelle Obama calling people “whitey.” Johnson appeared on Russian television network RT in March 2017 to argue that “there was some collusion overseas” between U.S. intelligence and the U.K. security agency Government Communications Headquarters (GCHQ) and that British intelligence gathered information about Trump that it passed to Obama-era CIA Director John Brennan. None of Johnson’s allegations are true. Several days later, Fox News senior judicial analyst Andrew Napolitano shared the theory (with anonymous attribution) on two Fox shows. It then spread over right-wing media and ultimately reached then-White House press secretary Sean Spicer. On March 16, 2017, Spicer cited Napolitano’s RT-sourced conspiracy theory in a press briefing to suggest that one of the United States’ strongest allies was illegally spying on Trump on behalf of then-President Barack Obama. The British government was displeased, and GCHQ issued a rare statement denouncing Napolitano’s “utterly ridiculous” claim. After The New York Times confirmed Media Matters’ discovery that Johnson was one of Napolitano’s sources for the conspiracy theory, Fox News suspended Napolitano “indefinitely,” which turned out to be approximately two weeks. (Upon his return to Fox, Napolitano doubled down on the claim that got him suspended.) When the controversy blew back on Trump himself during a press conference, the president ducked all responsibility and blamed Fox News. A few weeks after this incident, CNN reported that European intelligence agencies, including GCHQ, captured Trump campaign communications “during routine surveillance of Russian officials” and passed them on to U.S. intelligence. However, no agencies involved in this incidental collection were “proactively targeting members of the Trump team,” as Johnson, Napolitano, and Spicer had falsely alleged. Now, two years later, the president is pushing the same conspiracy theory that previously damaged the U.S.-U.K. alliance and which the British government has denounced as “utterly ridiculous” for the second time -- all because he was watching TV. Fox regular Joe diGenova: “It is now abundantly clear that in order to restore the integrity of DOJ and FBI, there has to be a full-scale federal grand jury of the Obama DOJ and FBI, CIA, and director of national intelligence." 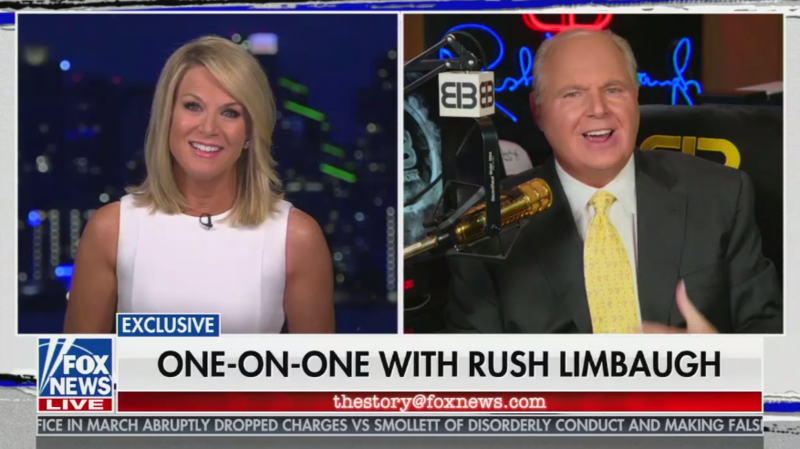 Fox News anchor Martha MacCallum allowed Rush Limbaugh to make long debunked claims, racist statements, and false accusations which she left unchecked throughout her interview with the right-wing radio host. During the interview, Limbaugh claimed fomer Secretary of State Hillary Clinton should be investigated, indicted and put in jail. Limbaugh offered no evidence to back up this claim, and MacCallum did not ask for any. Limbaugh also used a racial slur to attack Sen. Elizabeth Warren (D-MA), and MacCallum again let the attack slide without mention. Limbaugh then claimed Democratic candidates do not have plans to pay for their policy proposals, another falsehood that MacCallum did not push back on. A few minutes after Trump's tweet, Sean Hannity also gushed over Limbaugh's remarks on his Fox News "opinion" show. While Fox News presents MacCallum as a “straight news” host, labeling her as a contrast to its problematic opinion hosts, she continually pushes right-wing misinformation and allows conservative guests to present falsehoods with minimal pushback. As Media Matters' Matt Gertz recently wrote, "MacCallum is every bit as pure an ideologue as anyone else on the network, using her show to claim that a border wall is 'needed' to stop the immigrant 'invasion' and declare that 'both sides' were at fault during the white nationalist rally in Charlottesville, VA, among other misdeeds." Fox's chief political anchor Bret Baier, whom Fox touts as being on the “straight news” side, recently interviewed Limbaugh with similar results -- even though it was days after Limbaugh had called the New Zealand shootings a false flag. Baier and MacCallum hosted Fox’s town hall with Sen. Bernie Sanders (I-VT). Fox News is currently in an advertiser crisis and has been pushing "straight news" anchors like MacCallum and Baier as somehow distinct from its prime-time opinion programming. In reality, the two are cogs in the same machine -- as Rush Limbaugh himself just proved.